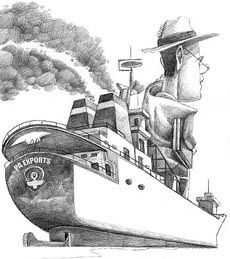 Another reason companies are reluctant to begin exporting is that they lack support and guidance, said Brent Rondon, manager of the Global Business Program at Duquesne University's Small Business Development Center. In March, his office will help lead a state trade mission to two Mexican states, Aguascalientes and Jalisco. Trade missions can catalyze the long distance relationship, but the region could explore other networks of trust. Alan Paul, who writes about the life of an expatriate for the Wall Street Journal, is located in Beijing, China. Just so happens that Paul is connected to the Steelers Nation in Beijing. Here is a direct line from Pittsburgh to the Chinese markets. Pittsburgh ambassadors live all over the world, connected to foreign networks of commerce and innovation. I'm certain that one Steelers fan would help another, likely pro bono. And you can't beat the established trust that already exists. Kea's mission is to connect New Zealand with its large global talent community, and contribute to the growth, development, and future prosperity of New Zealand by facilitating the sharing of knowledge, contacts and opportunities around the world. The first Kea Group was started in Silicon Valley, understandable given the organization's bent towards innovation and collaboration. Kea has a more homeland-centric approach to connecting global Kiwis than the alumni network of Australia's Advance. The brain drain issue is mission critical for New Zealand, a country with the greatest percentage of its highly skilled workforce living abroad (among OECD). Kea hopes to leverage this migration phenomenon to its advantage. New Zealand is desperate for talent, thus the orientation of the network towards the homeland. Like Globalscot, Kea aims to cultivate more entrepreneurial activity in New Zealand. Advance is a community of Australian professionals overseas headquartered in New York City, with established chapters in Boston, Chicago, Los Angeles, San Francisco, Washington DC and London with several others in formation around the globe. Advance recognises the importance of maintaining connection with the one million Australians in our diaspora making their mark in boardrooms, science laboratories, arts institutions, classrooms and communities worldwide. Advance is working hard to encourage brain circulation, but they soft sell the return with an understanding that many expatriates prefer to remain abroad. In that case, the primary focus is on enhancing connections with Australia. Advance recognizes that the diaspora has value regardless of its location. I think Advance offers the best model of diaspora networking I've encountered. I could see something similar working well for Pittsburgh. North Dakota Business Events have been held in five metro areas so far including Minneapolis, Chicago, Denver, the Silicon Valley and Portland, OR. If you become an ambassador and live in one of our target cities, you will be invited. You will hear good news from North Dakota at a dinner or reception attended by fellow North Dakota-connected people and business executives. Recent success stories range from a San Francisco-based expatriate building an arts center in his hometown to entrepreneurs returning to the state. The network also helps natives land jobs in places beyond North Dakota. The organization sees a benefit in helping North Dakotans wherever they may live. The region currently is home to about 62,000 foreign-born residents, the fewest of any major metro area, and local business leaders say they need a lot more. "A steady influx of working-age immigrants in their 20s and 30s would gradually enlarge the region's working-age population," a crucial factor in wooing more companies and offsetting a potential crisis as baby boomers begin retiring and the region's population continues to stagnate, said Peter A. Morrison, a demographer with think tank Rand Corp. While Pittsburgh does have the organizations and infrastructure to help new arrivals thrive in the area, there seems to be a lack of institutional push to get immigrants here in the first place. The Jewish Family and Children's Service is attempting to fill this void, seeking out immigrant populations in "gateway" cities. Pittsburgh could become a secondary migration destination, like Reading, PA is for Dominicans from the gateway city of New York. But the region needs to pave the way for this relocation of people. I think the Burgh Diaspora could be of some assistance. Pittsburgh expatriates living in gateway cities and possessing contacts with various immigrant communities are well positioned to sell the upside of living in their hometown. Indeed, if you're a retired, unemployed or aspiring scientist, a new world of opportunity awaits you. Some 100,000 scientists from 175 countries have already registered with InnoCentive, a visionary matchmaking system links experts to unsolved R&D problems, allowing these companies to tap the talents of a global, scientific community without having to employ everybody full-time. Launched as an e-business venture by U.S. pharmaceutical giant Eli Lily in 2001, the company now provides on-demand solutions to innovation-hungry titans such as Boeing, Dow, DuPont, and Novartis. For smart companies, the old notion that you have to motivate, develop, and retain all of your best people internally is becoming null. Of course, you'll still need great internal talent. But increasingly, you should assume that many of the best people reside outside your corporate walls. With an eBay for innovation, however, a massive reservoir of talent would be a few clicks away. Just because talent lives in Northern California doesn't mean that Pittsburgh can't benefit from that asset of intellectual capital. While that talent may demand proximity to other talent (the Creative Class thesis), those minds can be put to work anywhere around the world. As the online communities of ideas continue to develop, eventually there will be diminishing returns for proximity. We should steer our systems of education towards better online collaboration. I know from experience that an online community member learns quickly what she needs to know to thrive in the environment, while identifying expertise that can help her solve a problem. Not only does the virtual idea marketplace do a more efficient job of matching issues with experts, it produces more innovators. Local officials applauded Youngstown, Ohio's efforts to eliminate blight and tackle quality-of-life issues -- acknowledging parallels with Pittsburgh's Redd Up campaign -- but were hesitant to back a strategy that manages shrinkage over bolstering growth. The pro-growth development model isn't why Pittsburgh can't emulate Youngstown. What Vellucci is running into is the kind of political resistance that doesn't appear to exist in Youngstown. Pittsburgh is not an ideal location for urban innovation. Parts of Allegheny County resemble the Youngstown landscape, but the overall situation was never as dire. As a result, the Pittsburgh political machine remains largely intact. There isn't enough desperation to embrace a radical approach to urban development such as smart decline. In the end, after 16 days of searching for Cowher's replacement, it was really all about Tomlin walking into a room and the Steelers feeling his presence. 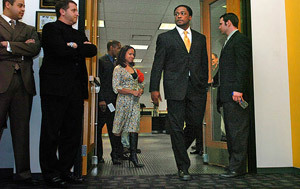 And it happened on Jan. 10, the first time the Steelers brought him to town for an interview. "He's an impressive young guy," Art Rooney II said, nearly two hours after he presented Tomlin as his team's coach. "You get in a room and spend two or three hours with Mike, you come away feeling like this is a special person. "The main thing you think about is when this guy is standing up in front of your team, is he going to get his message across. That more than any one thing is what convinced us this was the guy." Art II could have stayed in-house, and in-Pittsburgh, with now ex-offensive line coach Russ Grimm. Instead, the ownership heads boldly into the future with a public face on the organization who could be a symbol for New Pittsburgh. Mike Tomlin, by almost all accounts, is a rising star in the NFL. He may take a few seasons, but he will transform the team into something that Cowher wouldn't recognize. As Robert Rubin said on Charlie Rose late Monday night, we should make change our friend. Pittsburgh would be wise to follow Art II's lead. While out of the country, individuals might gain superior training and other kinds of work experience, develop new contacts, and enhance their productivity in other ways precisely because they are away. When they come back to Canada, if the conditions are suitable (i.e. the human capital and other advantages gained abroad are valued here), greater productivity should lead to higher earnings. Like Canada, Pittsburgh isn't the entire world. You either import outsiders who have the necessary experience and contacts, or you hope your intellectual capital comes home at some later date. I'm still skeptical that Pittsburgh expatriates will move back in significant numbers, but that shouldn't prevent the region from tapping the homegrown talent. The new arrivals are much more liberal, and tolerant, than established residents (previous waves were largely Orange County conservatives). Hispanics make up a substantial number the "equity refugees" (putting an end to the trend of white flight). Given the DECADES of exodus, where are all the stories about brain drain? Foreigners more than make up for out-migration, fighting against the tide of ballooning real estate prices. What we are witnessing is a major secondary migration, staffing Colorado's tech boom. But tolerance did not pull them here. Cheap real estate, a pleasant climate, great outdoor opportunities, and less traffic did. Indian innovation is being driven by a new class of innovation nomads working between the US and India. Tight links between India and the US – particularly Silicon valley – are not matched in Britain which fails to make enough of its Indian diaspora. I notice the growing importance of the co-location of innovation, in this case between India and the United States. Indian innovation nomads are an archetype of the emerging mobile class, driving the migration flows of ideas. Despite the significant presence of the Indian Diaspora in its own country, Britain is failing to tap into this network. What Britain lacks is a region on par with Silicon Valley. I'd recommend networking British innovation nomads, who are part of the mobile class vanguard. Similarly, Pittsburgh has failed to leverage the presence of the Indian Diaspora at CMU. The folly is trying to reproduce Silicon Valley instead of taking stock of the region's intellectual capital, wherever it may be. I'd like to see a debate about Pittsburgh's future that includes the Burgh Diaspora, breaking what I see as a political stalemate in need of a fresh perspective. Pittsburgh Today and Null Space's Chris Briem publish a wealth of data on the web. There are a number of pundits blogging about economic development for the Pittsburgh Region. Overall, there is sufficient expertise online to generate effective policy prescriptions. What's missing is a forum where all these elements come together in the form of civil discourse, hashing out a vision of progress for the entire area. The old-style attachment to Israel, treating it as a potential future home, a shield against assimilation, and an ongoing emergency needing support, is a mistake, Mr Lerman argues. “The way to continue it is with common concerns about education, civil society, human rights and values.” Even the Jewish Agency, a bastion of traditional Zionism, is changing tack. Makom, one of its partner agencies, now sends envoys to American Jews with a new brief: to get young Jews interested in Israel not by “hugging” it but by “wrestling” with it and its contradictions. Accepting this challenge may be Israel's best chance to stay relevant to non-Israeli Jews. Israelis may still speak of the gola; but the Jews who fled to the Hellenistic world after the destruction of Jerusalem's Second Temple in 70 AD deliberately adopted the Greek word diaspora, “dispersal”, because it was more neutral. “Diasporism”—the idea that Jews are better off outside the Holy Land—is a tradition that began with the prophet Jeremiah and still exists among a few ultra-Orthodox Jews. But increasingly, today's young Jews see the future not as a choice between Zion and exile, but as a fruitful fusion of both. I doubt Pittsburgh has a rich enough cultural tradition to survive many generations in exile, which indicates that the clock is ticking on enfranchising and networking the Burgh Diaspora. Furthermore, the parochial charm is busy dying off, which signals a reinvention of Yinzerville. In the meantime, perhaps Pittsburghers are better off outside of Pittsburgh. In a 2006 report, The State of Cities, Katz blames rigid zoning and building codes developed ages ago that now inhibit necessary redevelopment in cities, and state and federal subsidies that support expansion of housing and roads at the metropolitan fringe. "The whole country to some extent is paying a price for this not just economically but also environmentally," he says. "We have a long way to go." Katz is describing the lack of frontier geographies in many American cities, which has pushed development to suburbs and exurbs. Creative urban renewal needs the latitude and space to thrive, something you might find more of in Youngstown than in Pittsburgh. Perhaps Cool Space Locator can help us figure out where we can build New Pittsburgh. 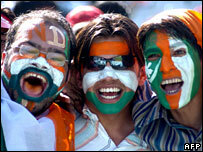 Cricket for South Asians across the world provides a space where all differences are overcome. The assertion of an Indian or Bangladeshi identity globally, expression of cultural nationalism or feeling of emotional commonality are all rooted in cricket. Interestingly, a poll conducted by a national daily in India a couple of years ago on the attitudes of the Indian youth found that more than 50% of the respondents, given a chance, would live in some other country. This figure might have been higher for Bangladesh given the continuing political and economic instability in the country. Yet all of these expatriates would inevitably stay up nights in the US to watch their country play in England and participate in detailed analyses of their team's strengths and weaknesses in countless internet chat rooms. I understand that the Steeler Nation is a subset of Pittsburgh expatriates, but the team is the centerpiece of the Burgh Diaspora's identity. I've wavered on the importance of a football team to networking the people who might invest in Pittsburgh, but I figure the game of cricket is of great interest to many innovators who were born in India. I have firsthand experience with academics from Pakistan who are crazy about cricket. Two members of the Pakistani Diaspora helped me to appreciate the game while I was in London during the World Cup. Thanks to them, I know who Wasim Akram is and I enjoyed partying with the New Zealand fans in Cardiff when their team won a World Cup match. State aid for small entrepreneurs also helps. Montana, which has a notably populist governor, has been pushing especially hard. In its last legislative session, the state legislature made even the tiniest of businesses eligible for aid. But Chuck Hassebrook, executive director of the Centre for Rural Affairs in Nebraska, says it is expensive to provide small business development services in rural America, even if there is a good return on investment. Rather appealingly, he proposes that the federal government shave 5% off its enormous farm-subsidy programme—which goes mostly to mega-farms—and give it to small businesses. “You could quadruple what the federal government spends on entrepreneurial rural development,” he says. Another channel is philanthropy. “Rural communities are not going to be rescued by large corporations setting up large factories,” notes Mr Hassebrook, but they could be helped by people with money (local boys who have made good in Chicago or Omaha, perhaps). In particular, he says, the rich should be encouraged to give not just to churches and libraries, but also to economic development. One remarkable case is Martindale, Texas, another worn-down southern cotton town. In 2004 Carlton Carl, vice-president of the Association of Trial Lawyers of America, bought most of the central district (he won't say for how much). He is refurbishing the buildings, hoping to attract artists and “a nice restaurant”. The trick is connecting the right person in the regional diaspora with the right opportunity back home. Economically depressed towns and cities should track down their high school graduates, updating them on the situation. I think now is the time to invest in Pittsburgh. A successful model Pittsburgh could emulate is that of Globalscot, a Scottish government initiative to build a network that "harnesses the expertise of over 900 senior, influential business leaders who are committed to generating opportunities for Scotland." The network is entirely comprised of Scottish expatriates who are interested in helping Scotland's economic development. On alternate mornings, Ms. Hurowitz, who lives in the neighborhood with her husband and two children, has breakfast five blocks away at Via Quadronno, another Italian restaurant specializing in thick cappuccinos, flaky croissants and a well-heeled clientele. “We always joke that Via Quadronno got my husband hired,” Ms. Hurowitz said. I suspect Richard Florida will seize upon this proof of concept, but I think Ms. Hurowitz describes the key ingredient to the value of proximity to other creative types, trust. In a sea of anonymity, a common patronage may serve as a transaction touchpoint. An appreciation of high-end baked goods may signal a shared outlook, another node of homophily. Expensive cupcakes may help locate the landscape of New Pittsburgh, where outsiders and unconventional thinkers congregate. Pittsburgh has its share of places that promote business between the established powerbrokers. The Cupcake Class offers a counternarrative to that of the Good Old Boys Network. Taking advantage of my unintended hiatus, I've decided to refocus the blog. My original goal was to organize the Burgh Diaspora primarily as a resource for Pittsburgh expatriates, while exploring the possibility of enfranchising this demographic as a positive force for change back in the home country. I now understand that Network Pittsburgh needs a cause, inspiring the civic engagement of a "critical mass of like-minded people." In this spirit, I pledge to tag all future posts with the themes I think are crucial to the New Pittsburgh project. I'll need to retroactively tag each post, allowing the reader to easily track the thread of each theme. However, I suspect that I am the only one interested in this utility. Organizing my thoughts into concept categories should help me find more like-minded people. Furthermore, I plan on organizing the listed blog links by theme. I also hope a blog or site ring will develop that is committed to helping to build New Pittsburgh. I will endeavor to collect links to similar projects to that of New Pittsburgh, an idea world of the like-minded.